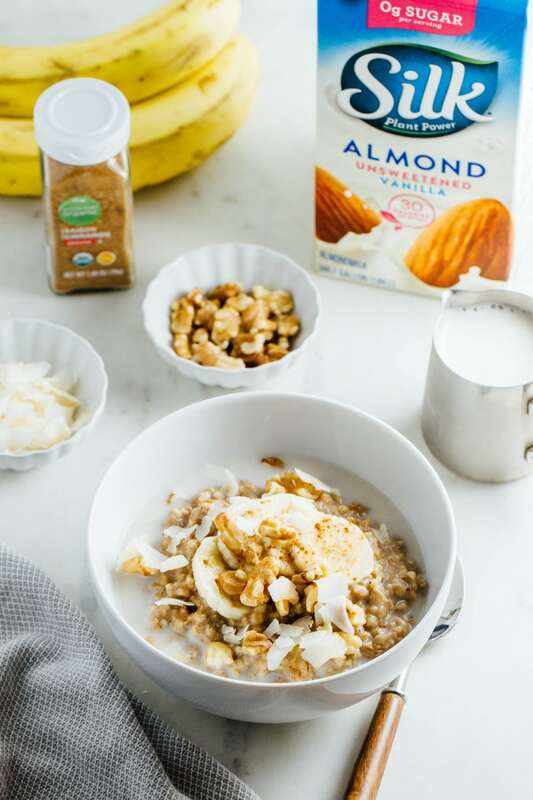 Steel-cut oats cooked up warm and cozy with almond milk, bananas, cinnamon, vanilla and sweetened with pure maple syrup is a healthy and delicious way to start your day! As we continue into the new year, I wanted to share an easy breakfast idea. One that will get you going in the morning, keeping you satisfied and fueled. 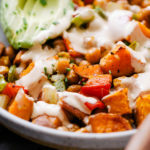 Since I’ve been on a crock pot kick lately, this recipe fits right in. I just love how easy it is to use a crock pot. Simply throw your ingredients in and let it cook. It doesn’t get much simpler than that! 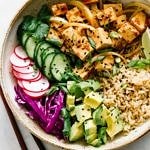 You’ll find the recipe to have simple and accessible ingredients, making it a great recipe for the meal rotation. 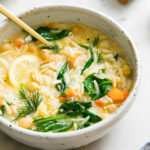 It also works as a great lunch or dinner option from time to time. I encourage you to put the ingredients on your grocery list, and keep your new year going healthy and strong. Bananas are a popular ingredient around TSV. They are healthy, economical and can be found throughout the year, making them a perfect addition to many types of recipes. 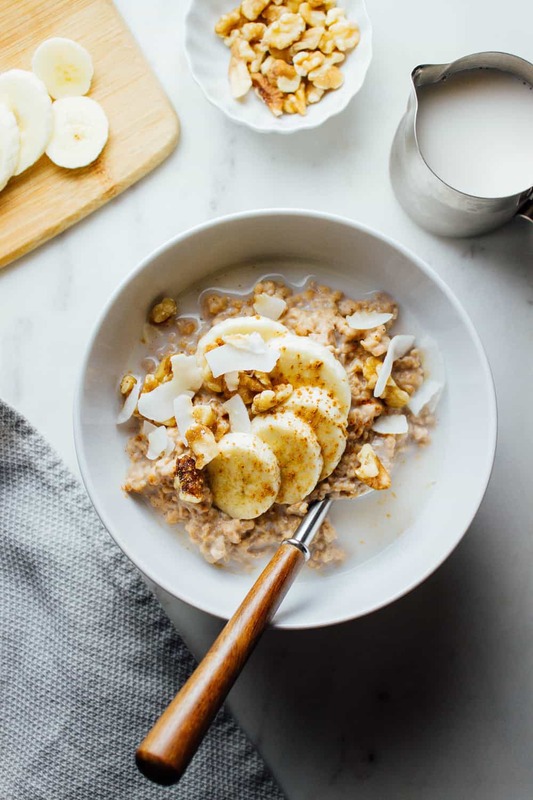 For this recipe we’ll be mashing ripe bananas to cook with the oats and then topping it off with a few fresh slices. They will add a slight sweetness and heartiness to the overall dish. Steel-cut oats cook up tender and creamy. 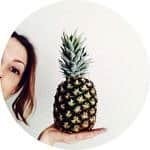 For the longest time I was under the impression that steel-cut oats were a bit more nutritionally beneficial than old-fashioned oats, but come to find out they are just about the same. The main differences are in the calories and processing. Steel-cut oats have about 20 fewer calories per serving compared to regular oats. The most significant difference is how they are processed. Regular and quick cooking oats are rolled and steamed for faster cooking, while steel-cut oats are simply chopped up whole oat groats. I love all the different types of oats, but have a growing affinity for steel-cut oats. 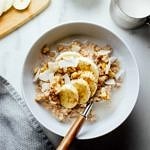 In this recipe I don’t suggest substituting either regular or quick oats in place of the steel-cut oats as they cook slightly differently. 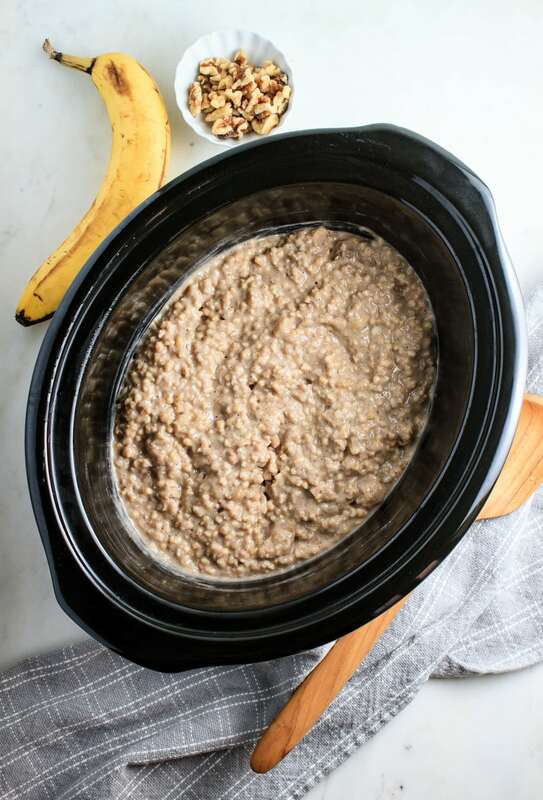 If you’ve never had steel-cut oats, this is a perfect recipe to try for your first batch. They are delicious! Using a crock pot makes the recipe extremely easy to make. Simply place all the ingredients into the bottom of your crock pot and set it on low for 8 hours. The oats will be ready in the morning and you’ll have a hearty, creamy breakfast ready to be eaten or taken on the go. 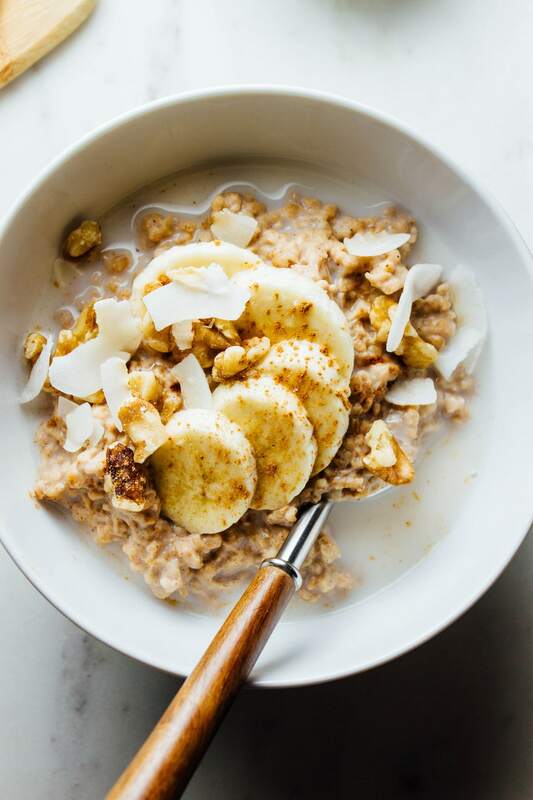 Top with fresh sliced banana, chopped walnuts, a little coconut flakes and splash of your favorite non-dairy milk. And there you have it, flavorful overnight Steel-Cut Oatmeal with bananas and nuts, made simple, wholesome and delicious! Oatmeal is accessible, economical and so versatile. Take a look at these other vegan oatmeal recipes, you may find a new favorite breakfast idea! See all vegan Oatmeal recipes on TSV! Oatmeal made in the crockpot. A warm and cozy way to start the day! In a 4 – 6 quart crock pot, place oats, water, milk, mashed banana, maple syrup, cinnamon, vanilla and pinch of salt, stir to mix, cover and cook on low for 3 – 5 hours, or up to 8 hours for overnight. If you can, it does help to stir 2 -3 times during cooking, but is not necessary. Once done, give a good stir, and add a tad extra non-dairy milk or water as needed to create desired consistency. Adding more liquid will create a creamier consistency. Oats will thicken upon standing. 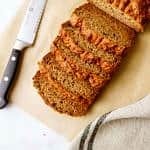 Serve with sliced bananas and nuts of choice. Drizzle a little non-dairy milk over top if you like. Adding a little toasted coconut will add another layer of flavor. Store leftovers in an air container in the refrigerator. Can be reheated with a little milk or water on the stove top over low, or in the microwave for a minute or two. Make this virtually fat-free by omitting the walnuts. 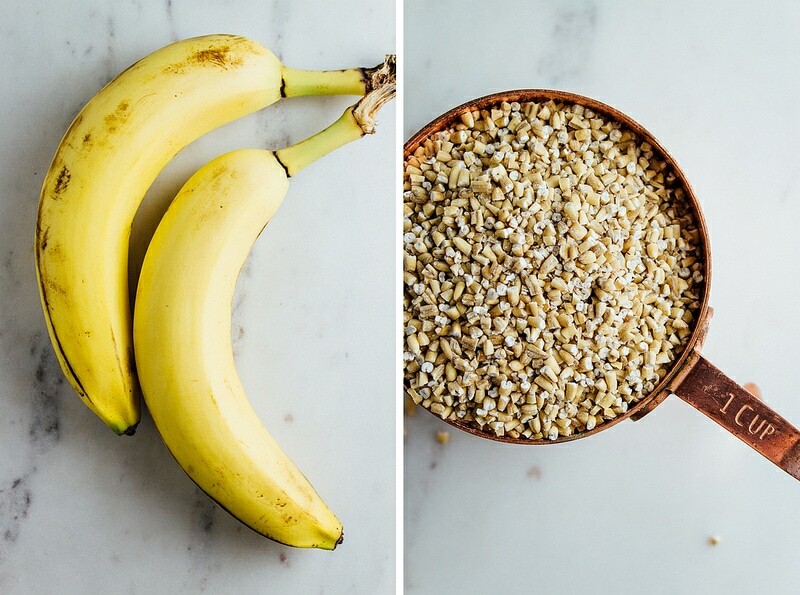 Bananas can be mashed smooth or left a little chunky. I do not recommend substituting old-fashioned or quick cooking oats in place of the steel-cut oats as regular oats require less liquids. This post is brought to you by WhiteWave Foods and Kroger. All opinions are my own and I think they are awesome! Thank you for supporting TSV by supporting our sponsors.